Ten defendants were originally handed a two-year prison term before the sentence for three of them was reduced on appeal on Sunday. They were accused of storming the Al-Raml police station in Alexandria and attacking its officers, as well as torching Muslim Brotherhood headquarters in March 2013. El-Masry, Journalist Youssef Shaaban and poet and activist Loay El-Ahwagy, who is already in jail in another case, were present for the appeal. Seven other defendants, who are part of the lawsuit, received the original sentence in absentia and did not show up after and hence their sentence was not appealed. Both Shaaban and El-Masry were arrested on 11 May during an appeal session to the case. This is not the first case in which El-Masry has received a prison sentence. The human rights lawyer and revolutionary socialist activist was released from jail in September 2014, after having served four months of a six-month sentence in a different case for charges of "illegal protesting" during the Khaled Said murder retrial in December 2013. 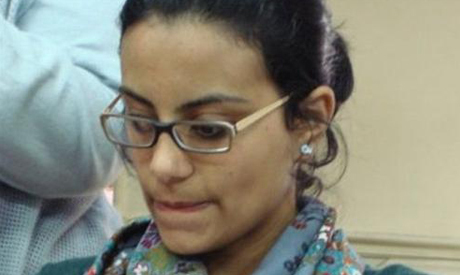 During her four months in jail, before the sentence was suspended, El-Masry was awarded the 2014 Ludovic Trarieux Award for her contributions to the defence of human rights. How the Ministry of just-bs justifies jailing activists, journalists, and HR lawyers for Phony charges and failed to find ONE crime to jail Mubarak thugs and cronies for? This is not justice, it’s just-bs! Egyptian fascist government has complete support from Western Nazis, If this thing was done by Iranian government they would be demonizing Muslims and Islams in all their media forums. Mahinour El-Masry is a good person. Much better than the detractors whinning about her and falsely accusing her. If only they would do 1/10000 of the deeds she does, Egypt would be in better shape. Come on give yourself at least 1200 thumbs up as you normally do, you are slacking off.